Baby, it’s cold outside. 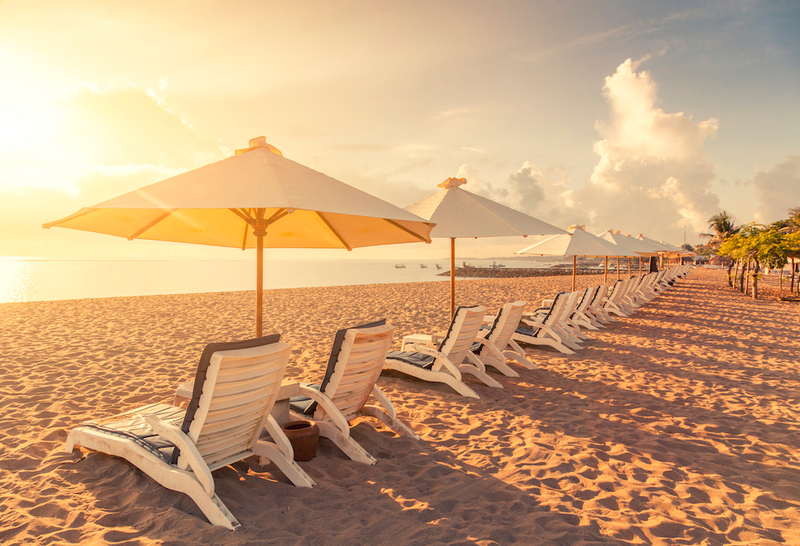 If you’re looking to escape the winter chill on an international getaway, there are few better, closer or more affordable options than Bali. By plane it’s roughly only 6.5 hours from Sydney and 3.5 hours from Perth, and because this island oasis is just 8 degrees south of the equator, it’s warm and tropical all year around. The best time to visit, however, is definitely the dry season, between April and October – which also just happens to be winter in Australia, so the timing for an escape couldn’t be more perfect. There’s a unique energy on the Island of the Gods, thanks to its intoxicating mix of beautiful landscapes, culture, people, food and incredible accommodation that ranges from cheap and cheerful to invitingly affordable luxury. This is the part of Bali you’ll want to visit if your idea of holiday heaven is a beach escape, sipping cocktails by the pool of your resort or private villa, enjoying chic spas and shopping, and drinking and dining at trendy rooftop bars and breezy cliffside hangouts. 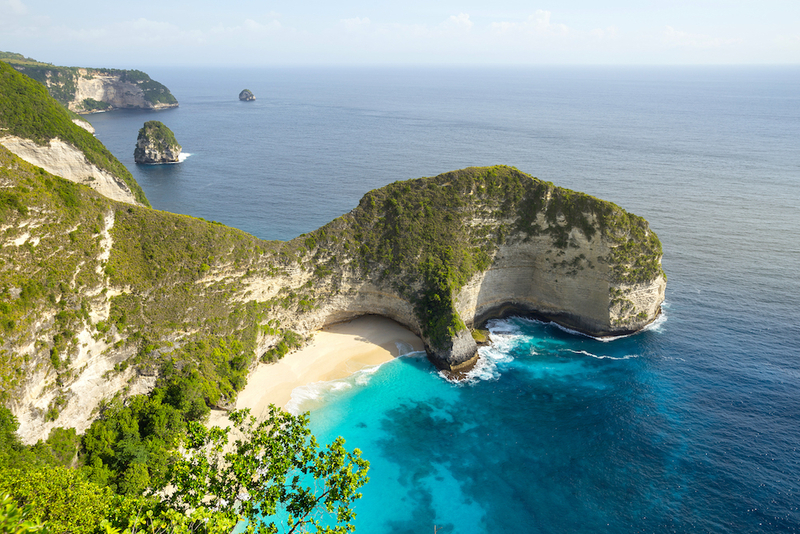 Aussie visitors to Bali are particularly enchanted with the white-sand beaches in the south, including the areas of Uluwatu, Canggu, Seminyak and Nusa Dua. Seminyak is the most luxurious area of Bali, offering world-class dining and bars, trendy nightlife and boutiques, and of course stunning beaches where resorts and world-class hotels line the perfectly white sands. Canggu is an up-and-coming resort area that’s a lovely place to chill out without to the price tags of Seminyak, while the manicured region of Nusa Dua is famous for its 18-hole golf course and all-inclusive resorts. The most southern part of Bali, Uluwatu, boasts jaw-dropping beaches and is one of the best spots for watching Bali’s famous sunsets. 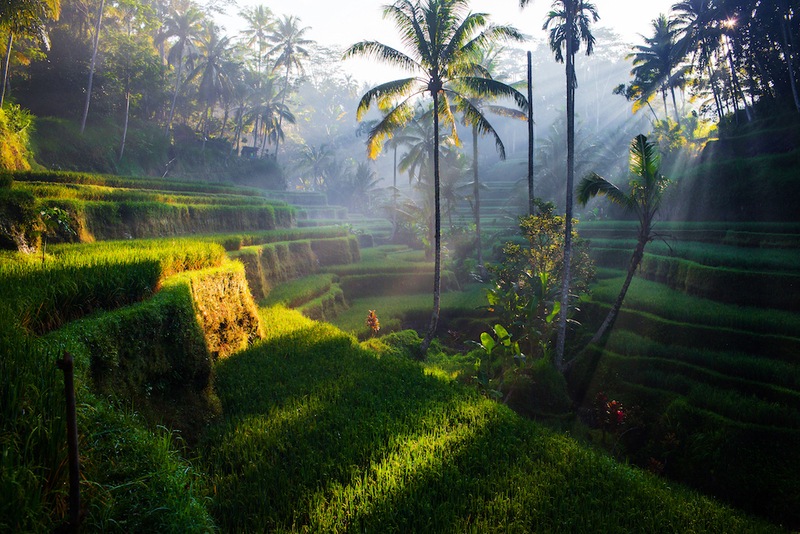 If you’re looking for a more cultural experience, head to Ubud in the heart of Bali. Delicious restaurants and bustling shops line the busy streets in the centre of town, and there’s a vibrant arts scene and thriving yoga community with endless tranquil retreats. Don’t miss Ubud Palace and its temple, Puri Saren Agung, other sacred temples, performances of traditional Balinese dancing, a visit to the Monkey Forest and watching the sunrise over Mount Batur. 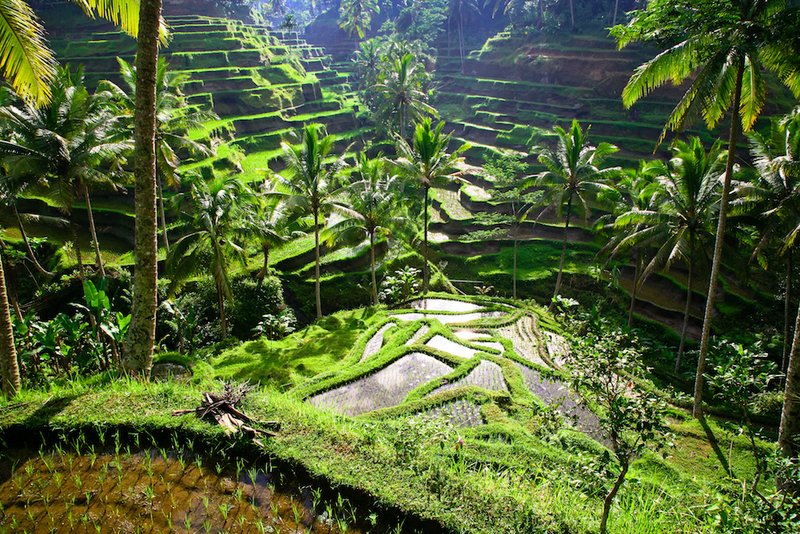 Just outside of town you’ll also find theTegalalang rice terraces – lush and iconic in this neck of the woods. And scattered throughout the entire Ubud region are endless interesting places to stay, from jungle villas and bamboo cottages to luxe hillside resorts with Insta-worthy infinity pools stretching out over the rice fields. Off the south-east coast of Bali are three super-gorgeous islands renowned for their blue waters, amazing marine life and rugged cliffs, and accessible by fast boat in around 30-90 minutes. There’s Nusa Lembongan, famous for its surfing, snorkelling and diving, and the must-see sunset-watching spot, Devil’s Tears. From Nusa Lembongan you can cross a cool yellow bridge to Nusa Ceningan – make sure you visit the Blue Lagoon on this small island, its colour will blow you away. Nusa Penida is the largest island of the three, boasting dramatic landscapes, small villages and the superb Kelingking Beach, which is surely the southern hemisphere’s answer to Navagio Beach on the Greek island of Zakynthos, widely considered to be one of the most beautiful beaches in the world. 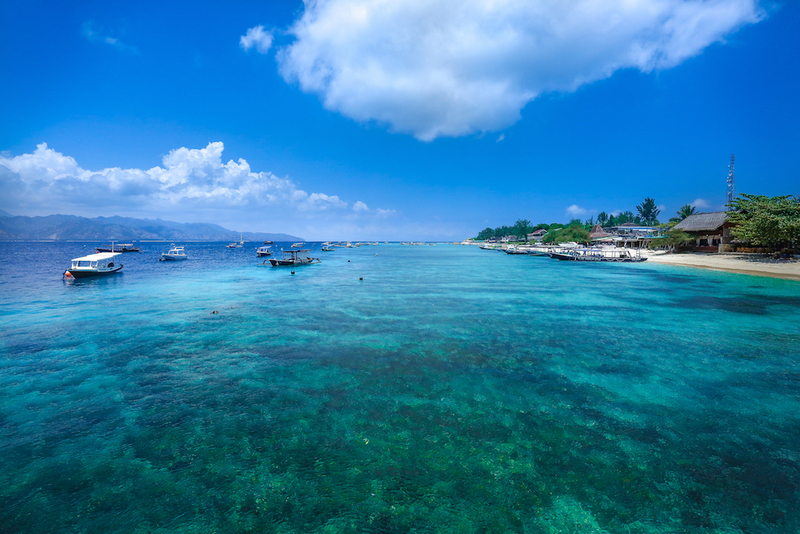 Meanwhile, to the east of Bali, just off the northern shores of the island of Lombok, lie the Gili Islands. They’re not actually part of Bali, but you can reach them by fast boat in about three hours – make the trip and you’ll be rewarded with crystal-clear turquoise waters, white sands and a totally relaxing vibe… in part because there are no motorised vehicles on these tiny islands. The largest island, Gili Trawangan, is known as the party island, so if that’s not your style, stick to Gili Air or the smallest and quietest island, Gili Meno. There’s amazing snorkelling and diving (there’s a good chance of spotting turtles), and watching the sun set over Mount Rinjani, an active volcano on the nearby island of Lombok, is the perfect way to end each day.